By accepting membership in the Australian, New Zealand and Asian Creative Arts Therapies Association, Inc. (ANZACATA), each member is bound to abide by the ANZACATA Ethical Standards for Therapists. It is the ethical responsibility of each member to safeguard the standards of ethical practice and to see that violations of the Ethical Standards are addressed. Members of the Association are required to cooperate with ANZACATA and, in particular, with the Board by responding to enquiries promptly and completely. 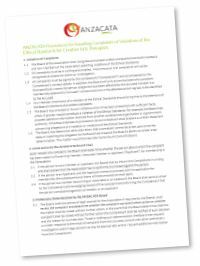 Please click the icon below to view and download the Procedures for Handling Complaints of Violations of the Ethical Standards for Creative Arts Therapists.